I chose to specialize in spine surgery to improve my patients’ quality of life. The most rewarding aspect of my work is playing an integral part in their life changing and emotional experience, allowing them to return to the activities they enjoy. 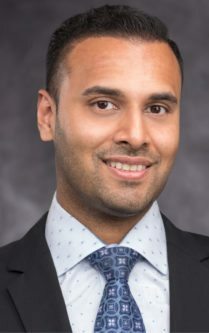 Before joining Florida Orthopaedic Institute, Dr. Samad was accepted into the School of Medicine and Health Sciences at The George Washington University in Washington, D.C. Following medical school, he completed his residency at Monmouth Medical Center in Long Branch, New Jersey, where he earned the Medical Staff Award for Overall Excellence, and twice the F & J Award for Excellence in Scholarly Activity. Dr. Samad has co-authored multiple publications and book chapters. He has also delivered presentations at national meetings on degenerative conditions of the spine. Dr. Samad enjoys spending time with his family, going to the beach, and traveling. So thankful to have found Dr. Samad. He is the kindest doctor I have ever met. He is also the best spine surgeon you could find. After putting off surgery for way too long, I have my life back, can go for long walks again and stand in the kitchen long enough to make a decent meal. For the first time in years I am pain free. I never dreamed that surgery would be the answer. I cannot say enough good things about Florida Orthopaedic Institute and Dr. Samad! Excellent surgeon and amazing bedside manners. Very respectful towards patients and gives you all the time you want. He performed a very complicated back surgery on me. I am happy to report I’m doing 110% better. Great doctor. I recommend him to everyone! Very intelligent surgeon! He gives a personal touch to all his patients and their treatment plans. I’ve never seen a doctor go so much out of his way for his patients. He takes the time to constantly follow up with you post surgery. He is very dedicated, kind, considerate and the list goes on! I highly recommend him! Best spine doctor you’ll ever meet! 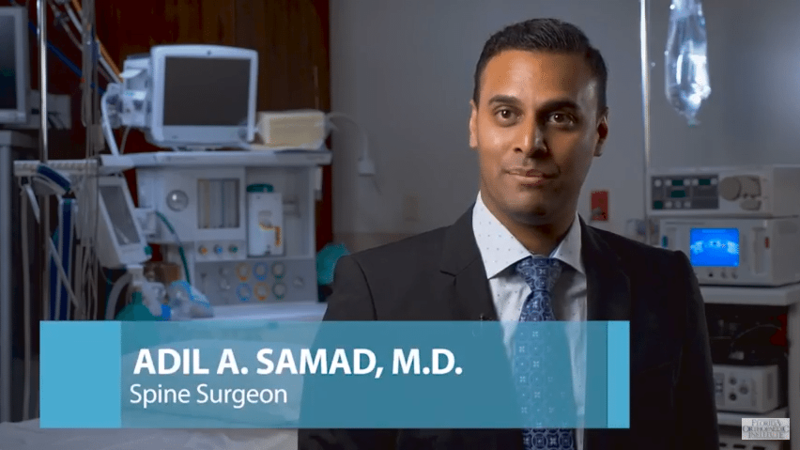 I experienced pain in my shoulder for years and when it moved on down into my arm, I went to see Dr. Samad. Best decision I have ever made. After neck surgery, I am pain free. He kept me informed every step of the way as to what the tests were for and what to expect. I can’t say enough good things about the treatment I received. I highly recommend this doctor. He has changed my life. I spent years experiencing shoulder pain. I then started experiencing pain and numbness in my arm as well. I was referred to Dr. Samad and developed a trust immediately. He kept me informed of exactly what every test was for and how it would proceed. After trying physical therapy, it became obvious that I would need surgery. Still informed of everything to expect, I felt confident that I was in very good hands. Surgery results were far more than I had expected. I would highly recommend him! I absolutely love this office, starting with the front desk to the nurses. Dr. Samad is a kind and caring doctor. He takes his time to explain everything in detail. His bedside manner is impeccable. I would like to give a shout out to Jackie who does all the insurance paperwork. She is awesome. Thank you, Dr. Samad for all your help with my surgery. It has been exactly two weeks since Dr. Samad operated on my spine and I am doing so much better. My back and leg pain is gone. My balance is greatly improved and I am now walking without the assistance of a walker. Prior to the surgery, I had pain that fluctuated from one to ten and my poor balance caused several falls. I would recommend Dr. Samad to anyone with back problems. Dr. Samad recently performed an anterior cervical surgery on me and I am very satisfied with the results. I’m feeling better each day and so many of the problems I was having the neck and head area have been resolved. He is a very caring doctor, explains procedures very well and came to check on me every day that I was in the hospital. He was in contact regularly with the nurses as to my care and condition. I would highly recommend Dr. Adil Samad. He is the best! Dr. Samad is excellent. He is always professional and interested in my well-being. Dr. Samad is very knowledgeable and a pleasure to work with. More visits to come to try and get my old body better! I was very impressed with the level of care I received from Florida Orthopaedic Institute. It was my privilege to be treated by Dr. Adil A. Samad, who was thorough and proactive in diagnosing my condition. Upon diagnosis, a plan for treatment was immediate and within a month I had undergone surgery to decompress my spinal cord. The skill and professionalism of this physician cannot be overstated!! As an added bonus, Dr. Samad is very personable and possesses the rare ability to explain complex concepts in an understandable way. I strongly recommend Flordia Orthopaedic Institute! If I have spine problems in the future, I will schedule an appointment with Dr. Samad. He is the perfect doctor for me. Dr. Samad was very compassionate with my mother. He treated her with respect and listened to her. We saw him in Brandon and also traveled to Sun City. Knowledgeable and professional with a great personality. I had a very pleasant and helpful experience at Florida Orthopaedic Institute. Dr. Adil Samad did my spine surgery and the results have been excellent. I feel I am improving everyday. He is a very caring and thoughtful doctor. I found his information to be very helpful in my recovery. I would highly recommend Dr. Samad to anyone I know if they find themselves in need of this spine surgery. It was great to have Dr. Samad as my doctor. He was very knowledgable and explained exactly what he was going to do. I’m feeling great! I have been in pain for over 2 years with 2 bulging discs. I’ve done numerous things to try and help but nothing has worked. I was referred to a surgeon which I was extremely nervous about because I have never had surgery before and having 3 kids, 1 being special needs I had to do something because it wasn’t fair to my kids. I wasn’t able to be the mom I needed to be. I went in for a consultation with Dr. Samad. He came in friendly and took his time to answer any questions I had. Based on everything he went over with my MRI he recommended I have surgery. He told me to go home and talk it over with my husband and write down any questions and to make a follow up appointment. I came back with all of my questions and he answered all of them. I ended up scheduling surgery. It was the best thing for me and I am so glad I did it. Recovery wasn’t bad at all. I was up walking the next day. Dr. Samad was amazing. He even called my husband to check up on me the day after we left the hospital. He gave me my life back. I am not in anymore pain. I would recommend him to anyone who asks about an orthopaedic surgeon. He’s the best! Dr. Samad diagnosed the cause of my back pain and after a trial of PT without relief, we discussed my options. He recommended that I be seen by Pain Medicine since it was a less invasive treatment to see if that provided relief for my pain. Dr. Samad was so kind and went above and beyond to make me comfortable and answered all my questions. The Pain Medicine MD that Dr. Samad suggested I see was wonderful, providing pain relief with an ablation. I will certainly have Dr. Samad do my back surgery if this becomes necessary in the future. I would certainly recommend Dr. Samad to family and friends. Thanks Dr. Samad! Dr. Samad is very easy to interface with–no superiority attitude. Excellent job on explaining what to expect and very understanding of my feeling and anxiousness to move on. Cautioned me on what not to do and what would be appropriate activities at this point in my recovery. I can not say enough for his personal and professional approach to me as a patient. Dr. Samad recently performed an anterior cervical decompression and fusion on my C4-5 and C5-6 vertebrae. He and his staff are very friendly and personable. While I was in the hospital, Dr. Samad came in each morning and evening to talk with me and see how I was doing. I would recommend Dr. Samad to family and friends. This was my first experience with Dr. Samad. I have been extremely happy with the level of care. He is not only skilled in his field, but has taken the time to explain in detail, from start to finish, his plan for treatment. I would definitely recommend Dr. Samad to anyone. I was in so much pain and nervous, but he walked me step-by-step through the process all the way up to my surgery date. His assistant was awesome too, she worked with me thorough all of the scheduling conflicts as well as made sure my surgery took place. You do not get many doctors that care about your well-being like Dr. Samad. Dr. Samad is a fabulous doctor. He knows exactly what he is doing and treats his patients like his own family. He took my mother’s shooting pains away after one procedure. We are incredibly happy with the results. We are grateful for Dr. Samad and his team. I recommend him. I had surgery on my neck on December 21st and Dr. Samad eased the stress and anxiety I was feeling just by his bedside manners. Dr. Samad is a very caring and loving doctor. Not once was I worried about his knowledge of the procedure he was performing. I just had my three week checkup and all is good. Thank you for all that you do! I cannot say enough good things about Dr. Samad. He is my hero! Dr. Samad is the whole package… professional, confident, understanding, kind, and an outstanding surgeon with a great bedside manner. I traveled from Lakeland to Brandon just to have Dr. Samad perform my c-spine surgery. I was impressed with how well this surgery went. When someone thinks to have surgery on your neck, it can be nerve racking. However, after surgery I was surprised it was not nearly as bad as I anticipated. In fact, it was one the best decisions I have ever made. Right after the surgery the sharp pains going down my arms were completely gone. I highly recommend Dr. Samad and if need be, I will be back! Also, I have to shine a star on Dr. Samad’s MA, Jackie, she is an angel. She is with you every step of the way! You could not ask for a better team than this! I would highly recommend Dr. Samad to my friends and family! It was great to have Dr. Samad as my doctor. He was very knowledgeable and explained the exact procedure he was going to perform. Today, I am feeling great! He is a wonderful and caring doctor. He is great to talk to and listen to your concerns. I would not hesitate to recommend him to my friends and family. Very friendly and conservative doctor. I really like his manners, knowledge of the spine and its workings. I would definitely refer patients to him. Great experience with Dr. Samad. He is always available after surgery. I would definitely recommend him to family and friends. I had a very pleasant and helpful experience at Florida Orthopaedic Institute. Dr. Adil Samad did my spine surgery and the results have been excellent. I feel I am improving every day. He is a very caring and thoughtful doctor. He always answered texts my husband sent him during my two weeks post op. I found his answers to my questions to be very informative and helpful in my recovery. I would highly recommend Dr. Samad to anyone I know if they find themselves in need of spine surgery.